The movie starring the infamous giant gorilla, King Kong, has been an inspiration for software developers lately. Currently, there are three online slots available on the topic: the original Cryptologic game which you can play for free here, Island of Skull Mountain from Amaya and Playtech’s King Kong. The action of all games revolves around the story of a filmmaker who travels with his cast to an island where they meet a giant gorilla whom they film for a movie. While the Amaya’s game takes place on an island, the Playtech’s video slot is played at two modes, the Jungle and the City mode, each one with its unique bonus features. All three offer superb graphics, but as you can see from the screenshots below, they are barely resemble one to another. 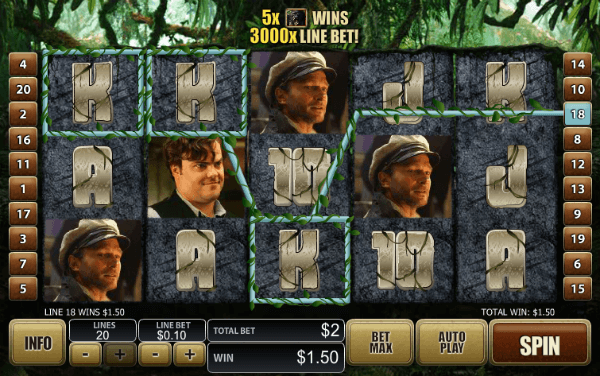 Cryptologic and Amaya are more of a cartoon type slots, while Playtech King Kong, being licensed by Universal, features videos from the 2005 blockbuster. The high paying symbols are depicted as the real actors from the movie, so your reels will be populated with the images of Naomi Watts, Jack Black and Adrien Brody in different scenes of the movie. Unfortunately, non of the three is available to USA casino players. The best solution we can offer you is the superb USA friendly Slots LV casino, where you can play over 400 slots. Try it with our special $22 No Deposit bonus. The game from Playtech features more realistic visuals, so in the introductory movie you will be presented with the embarkation on the ship which will take you to the mysterious island where the action takes place. On the other hand, in the Amaya’s game you will find yourself instantly surrounded by the wilderness, totems and smoke. You need to line up at least two top paying or three low value symbols on a payline to win a prize. While the game from Amaya offers 243 ways to win, Playtech and Cryptologic video slots are played with 20/25 adjustable winning lines. In the Amaya’s slot you have to place at least 25 coins at the denomination between $0.01 and $0.25 while the top bet stands at $31.25 for 125 coins wagered at the maximum coin size. If you are a penny slots fan, the other two would be a better choice with minimum bet of just 1 cent. 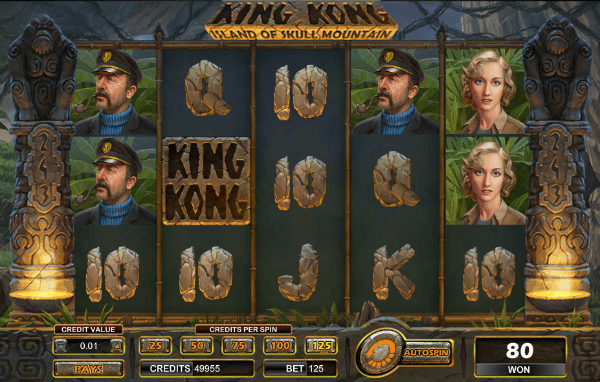 The King Kong Island of Skull Mountain slot features Wild and Gate symbol bonus. While Wild, appearing on all the reels except the first one, substitutes for missing symbols to help you form more winning combinations, the Gate symbol appears on every reel and when the Gate opens the symbol that is hidden in it is revealed. 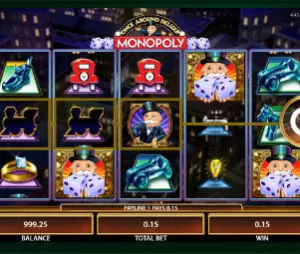 Thus, the entire reel featuring the bonus symbol is covered by the same symbol which may lead to huge payouts once you manage to form winning combinations including it. On the other hand, Playtech’s King Kong delivers Wilds and Scatters. Depending on the mode in which the game is played, Wild, besides acting as a joker, delivers 3 free respins in different surrounding during which you get sticky Wilds active till the end of the feature. Scatter represented as the movie and game official logo, triggers Skull Island Bonus or City Tower Bonus interactive games during which you are rewarded for picking the same animals or smashing the planes, respectively. All three provide you with a highly exciting gaming experience. In the Amaya slot, in spite of 243 ways to win, you can spin up to 10 rounds in succession without a single cent won, but thanks to the Gate symbol and the paying structure in a single spin you can earn a fortune. As for the Playtech game, you will surely enjoy the smooth gameplay and the changing settings of the scenes, as well as its bonus features that can help you improve your balance significantly. Cryptologic game is for the classic Vegas casino slots lovers. It’s not as flashy as the other two, but that’s also one of it’s main advantages. Bottom line, we give a slight advantage to the Playtech slot machine due to its overall appearance and the unique bonus features.